Sean here with this week’s update. Just a few more days (this coming Tuesday), and then we’re back with Yesterday’s Gone’s FOURTH SEASON!!! 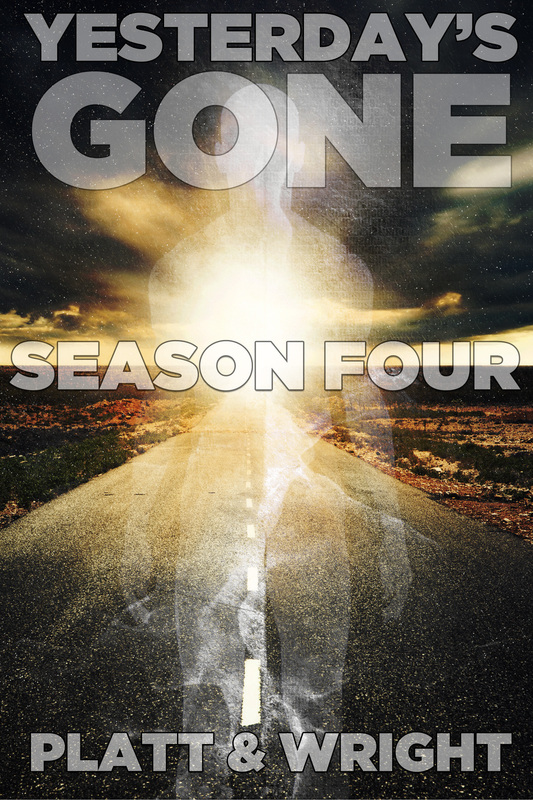 NOTE: Yesterday’s Gone Season Four is not back from our editor yet, so you may spot a couple of typos. You get to see our flubs because you’re a Goner and we love you! Also, we tweak right up to the end, so while this is a chapter from the new season, it’s not necessarily the first. Last week I told you that we were going to be launching Yesterday’s Gone a bit differently, and we are. Last year we were running our schedules so tight, we were never more than a week ahead of what you were reading. That meant we were only working on episode three of while you were reading two, during every series we wrote. This drove us a bit nuts because we thought we would be able to write better stories if we could get ahead enough to see everything at once. FINALLY, at the end of last year we finally did. Our first series this year was the second season of Available Darkness. Because we were able to get the entire season finished before we published the first one, we decided to try something different, releasing the season at once, and individual episodes for FREE. That didn’t work even a little bit. The idea was that readers who wanted to get the entire season could do so immediately, then Dave and I would gain attention for our work by climbing the free charts, and encouraging our readers who were reading for free to help spread the word and review. But less than 1% of our free readers reviewed, and Amazon changed their algorithm (this is super boring to explain, but essentially it means that they greatly reduced the “weight” a free title’s given, thus reducing its value to us). We tried again with WhiteSpace: Season Two, removing the free episodes but still keeping the full season. Again, our strategy failed. With WhiteSpace, readers bought the full season all at once. I understand this, I binge too. However, we sold less than one episode for every hundred seasons, thereby destroying the serialization. This meant we weren’t getting any new readers because we weren’t being seen. (One of the benefits of doing weekly serials is that it allows us to stay high in sales charts for longer than a single book, allowing more people to see our books). So with Yesterday’s Gone Season Four we’re returning to weekly episodes, and the full season won’t be out until it is over. We are doing this in the hopes that there will be enough buyers at .99 per episode to push the series onto horror and sci-fi charts and give us some new readers, and because we would like to preserve the excitement and anticipation that comes from the cliffhangers and serialized structure that we work so hard to articulate. What Dave and I don’t like is that it creates six files for you to read rather than one, which is absolute crap and we totally hate it. Someday we’ll have an app or a better solution. For now this is the best we can do. This strategy is a gamble because we make less than half the royalty at .99, but we’re hoping we make up for it with new buyers. Either way, we don’t have a choice. We have to try something as writing for a living is still something that’s month to month for the both of us. We believe in the stories we tell, and you as a Goner to keep reading and supporting us where you can, but 100% of our money comes from our books, so with each new title we must run with what’s best for you as the reader, and us as the creators. After Yesterday’s Gone, you’ll be reading Z2135. So far it’s turning out AWESOME. There’s a big leap in world building from the first season to the second, and it has us both thoroughly energized. So. cool. If you join our Yesterday’s Gone launch party Monday night, make sure to ask about it. I’ll be discussing it more soon, but can only ramble so much in one email without Dave going bonkers. If you have any questions, just click reply to this email. As always, thanks for reading. See you next week!